As always, economic, business and organizational trends pose challenges for the tidy and harmonious world that HR practitioners want to create. One of the trends posing a challenge is the new rise of very flat organizations. The rise in flat organizations is being driven primarily by cost-cutting initiatives that require the elimination of expensive layers of management. There are of course varying views on the benefit of flat structures. On the one hand, flat structures are applauded as the answer to stuffy hierarchical structures as they increase collaboration and the speed of decision making. The argument goes that because decisions have to be made quickly by employees close to the working level, flat structures avoid delays caused by organizational rigidity. So a flat structure is more adaptable and responsive to customer needs. There is also the view that this trend supports employee empowerment, as more autonomous employees require less management. On the other hand, flat structures pose a challenge for those who want to move up the organizational ladder….because there is no ladder, it’s more like two or three steps. So now, amid the growing challenge of identifying talent, HR practitioners no longer have the promise of progression up the organizational ladder as a tool of retention. So how can one retain talent in flat organizations? I think there are 3 ways that this can be done. The idea behind the old organizational ladder climb is that people over time want more money, greater challenges, acknowledgement, increased control and opportunities for leadership. In a hierarchical organization this is delivered by a series of promotions into positions of leadership. The reality however, is that all this can be delivered to employees without them moving in a vertical fashion through the organization. In the first place, not all top performers are good leaders, so a culture in which real growth is only accomplished by moving vertically may result in a system of good employees turned bad managers. A jungle gym is not a single ladder. It is a system of multiple challenges, obstacle courses, rest areas, individual and group activities. All of which are very interesting, engaging and fun. A similar environment can be replicated within an organization by creating highly developed systems of employee engagement, development and enrichment focused on learning and personal growth. This may include projects, external assignments and groups. A jungle gym allows employees to climb up and down varying projects, initiatives, activities and focuses within the business. Sometimes leading, sometimes following but always learning and increasing a wide range of competencies. Jungle gyms are challenging but never boring. 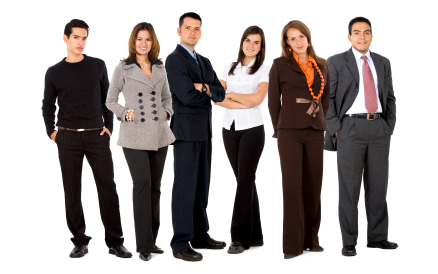 It allows employees to explore a wider range of competencies and truly learn their talent and capabilities. The jungle gym approach removes the risk of poor managers as only those employees who are truly leaders end up being selected to lead and the non-leadership track is no longer seen as the conciliatory prize for those that didn’t quite make it. Work life balance, while an acknowledgement of the fact that employees have an existence outside of work, still focuses on the separateness that must exist between work and life. Work life integration however acknowledges that the two cannot be separated into neat bundles that exist beside each other but never touching. Organizations that allow for or even encourage the intermingling of work and life create an existence that actually makes it difficult for the employee to extricate themselves from the organization as the organization becomes inextricably bound with their lives. Initiatives that allow employees to integrate their life activities like charity, child care, elder care, wellness, education etc. with their work, change the dynamic or perception of work. Work is no longer the intruder on life but actually the facilitator of life. I do recognize that there are many who oppose Maslow’s Needs Hierarchy as an overly simplified view of humans and research into improved and more modern views abounds. However, I personally believe that there is significant value in the Needs Hierarchy and its principles may be very useful for flat organizations. 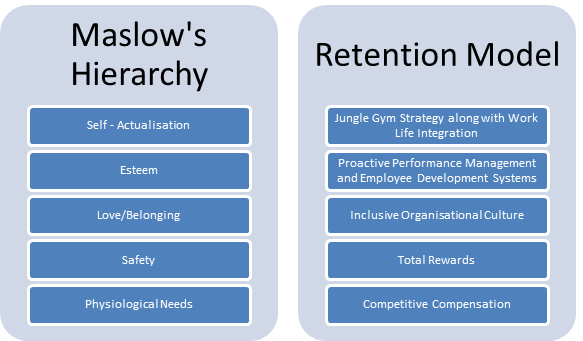 The table below is a very simple way in which Maslow’s hierarchy can be translated into a retention model. With all that said, it is important to remember that all efforts for retention exist on the assumption that the specific business wishes to retain the talent that has been acquired. Therefore, the first step is ensuring that you have the right team in place because the only thing worse than acquiring bad talent is keeping them. Deveen Hunter M.Sc., CAPM, CHRL is a human resource practitioner and entrepreneur with over 8 years of global human resource success. She is the founder and lead consultant at Select Business Solutions, a boutique consulting firm that is focused on assisting clients evolve the ways in which they create value for stakeholders by leveraging technology, analytics, processes and human capital. With a background in sociology and psychology she is an ardent researcher, continuously searching for insight into human behaviour at the organisational level. When she is not focused on innovating the Human Resource discipline and growing her firm, she is focused on the most fascinating person in her world, her nine-year-old daughter. Deveen is currently working on research to develop a human resource model focused on addressing the unique challenges of recruitment in the Canadian context. Read more here. Three popular articles this week on HRinfodesk Why is domestic violence more often becoming a workplace responsibility?